When arriving at an airport, it's always nice when you can do a straight-in approach. Just as often, however, the wind will be such that they'll be landing in the wrong direction, so that you have to circle around the airport and land from the far side. When there's an ILS being used for the active runway, this can mean a detour of quite a few miles in order to come around and enter the funnel properly. However, the approach plate for many ILSs provides a means for simplifying the entry into the funnel when you're arriving from the wrong direction. The means is called a procedure turn, a technique you'll use on the present flight. 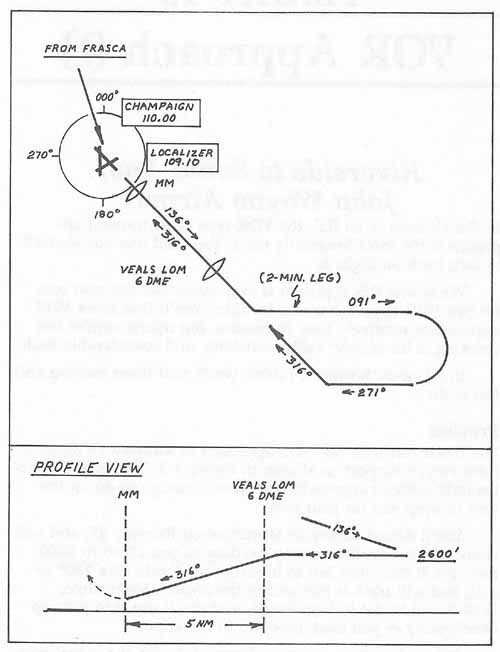 Figure 4–2 is a simplified version of the published plate for the ILS approach to Runway 32 at Champaign-Urbana (the University of Illinois); the actual plate may be found in Chapter 5. Note that the official plate looks more complicated than the figure, mainly because it has a lot more information on it than you'll actually need here. Arrival. On arriving at this airport from the north, you'll fly directly to the Champaign VOR, which is located right on the field, and then you'll track the 136° radial outbound from the station. Outbound. While proceeding outbound, you'll first pass over the middle marker, and then at 6 miles DME you'll pass over the outer marker (Veals). As shown by the profile view, if you are not already at 2600 feet, you begin a descent to that altitude while on this outbound leg. Procedure Turn. Then, at about 8 miles DME, you'll turn left to heading 091°, as shown by Figure 4–2. Hold 091° degrees for 2 minutes; then start a 180° turn to the right, to an inbound heading 271°. The Localizer. You'll already have NAV-1 set to the localizer, and, as you proceeded back in on heading 271°, you'll need to monitor the localizer needle. As it approaches center, start a right turn to 316°, the localizer heading; then track the localizer inbound. Descent. As the profile view indicates, you'll begin your descent from 2600 feet just before passing over the outer marker—about 6.5 miles DME. The glide slope needle should be just about centered at that point, and you'll begin to use it to regulate your descent. Decision Point. As shown by the profile view, your decision point is the middle marker: When you get the signal from that beacon, either you have the runway in sight and can land, or you don't see the runway so need to pull up and execute the missed-approach procedure indicated on the plate. Departure. You're at Frasca Field, just outside Urbana. If you wish, you call the ATIS (Automatic Terminal Informatin System) at Champaign-Urbana on communications frequency 124.85 to get the current recorded message. Take off on Runway 28; maintain heading 280° to 2600 feet and level off. Have the approach plate handy (Figure 4–2), and study it intermittently en route whenever you have a moment or two to spare. Homing on the VOR. NAV-1 is set to the localizer for use later on. You can use the DME, but ignore the NAV-1 needle entirely for now. Instead, use NAV-2, which is set for Champaign R-136. When the NAV-2 needle begins to move, turn left to 136°. Intercept R-136 and center the needle as you fly to the VOR. Monitor the DME for distance to the station. Station Passage. You'll pass over the station when you're right above the airport. Remember not to chase the needle when within 2 or 3 miles of the station—just hold your heading of 136° while the needle drifts from center. You'll hear the middle marker signal shortly after station passage. Outbound Leg. Keep the NAV-2 needle centered as you track the 136° radial outbound from the station. You'll hear the signal from the localizer outer marker (Veals LOM) at about 6 miles DME—2½ minutes after station passage. SAVE the current flight parameters. Don't forget—you're using NAV-2 now, not NAV-1. Procedure Turn/Outbound. At 8 miles DME, first glance at the clock, and write down the time. Then turn left to heading 091°. Hold 091° for 2 full minutes. Procedure Turn/Inbound. Two minutes after turning outbound on the procedure turn, start a 180° right turn, to come back in toward the localizer on heading 271°. Intercepting the Localizer. Now switch attention to NAV-1 and ignore NAV-2. When the localizer needle on NAV-1 is one dot from center, turn right to heading 316°. Center the needle, and track the localizer inbound. Descent. At 6.5 miles DME, throttle back to begin the descent. Monitor the glide slope needle now, and adjust engine power as required to get it centered and keep it there. Just after starting the descent, you should hear the signal from Veals LOM. Keep both needles centered. Use very shallow turns and small interception angles to center the localizer needle, and adjust engine power as required (gently) to center the glide slope. Landing. When you hear the middle marker signal, if you have the runway in sight, abandon the needles and land. If you don't have it in sight, execute the missed approach procedure, which you of course memorized before you began the approach (ahem! ).